We start out with "A Tale of Two Field Days," in which Rick Ruhl, W4PC, shares his story of helping build excitement about amateur radio for two young girls as they visit two different Field Day sites in northern Alabama. Next, we conclude the two-part introduction by David Witkowski, W6DTW, and CQ Propagation Editor Tomas Hood, NW7US, to using JT65 (developed for moonbounce) for weak-signal HF communications. 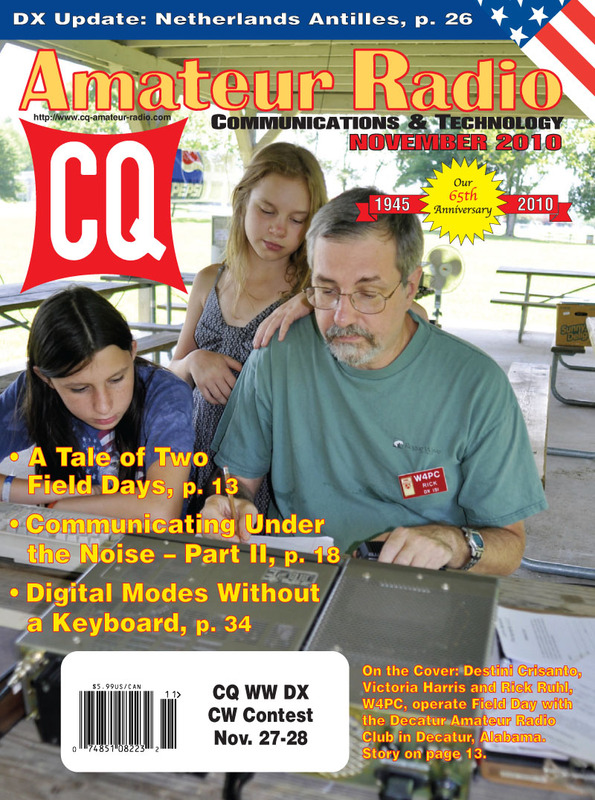 Next, we bring readers up to date on changes in the Netherlands Antilles and how they are likely to affect the count of ham radio DX entities; then contributor Dennis Lazar, W4DNN, shares his story of a mysterious "boatanchor," as well as some recollections of designing a QRP "crow" during the Vietnam War; followed by the rules for the 2011 CQ World Wide 160-Meter Contest. Once again, the contest will begin at 2200 UTC on Friday and will end at 2200 UTC on Sunday. Continuing with this month's features, Pete Kemp, KZ1Z, offers ideas for "Operating Digital Modes Without a Keyboard;" Brian Page, N4TRB, takes us "Back to the Future with the AWA" (the Antique Wireless Association), and Kai Siwiak, KE4PT, shows us that "You Can Enjoy DXing with a Modest Station... and the CQ DX Marathon Shows the Way." We've also got a brief reminder that time is running out to qualify for CQ's Diamond Jubilee Worked All Zones Award -- December 31st -- and reprinted the rules for anyone who's lost track of them. 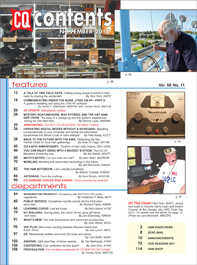 Among our columns for November, Irwin Math, WA2NDM, looks at microphone basics in this month's "Math's Notes" column; "Washington Readout" editor Fred Maia, W5YI, has a primer on staying in compliance with the FCC's RF safety requirements; and Public Service Editor Richard Fisher, KI6SN, reports that "Sometimes Real-Life Events Tell the EmComm Story Best." On the topic of emergency communications, "Learning Curve" editor Rich Arland, K7SZ, looks back nine years to the 9/11 terrorist attacks and ham radio's role in helping provide communications. Mobiling Editor Jeff Reinhardt, AA6JR, focuses on "Mobiling and Automotive Technology of the Future," pointing out that a ham rig is just one of many devices in your car that relies on RF and antennas to do their jobs. "Kit-Building" editor Joe Eisenberg, K0NEB, covers a variety of topics this month, including parts storage, the NADC-40 kit and some holiday gift ideas. 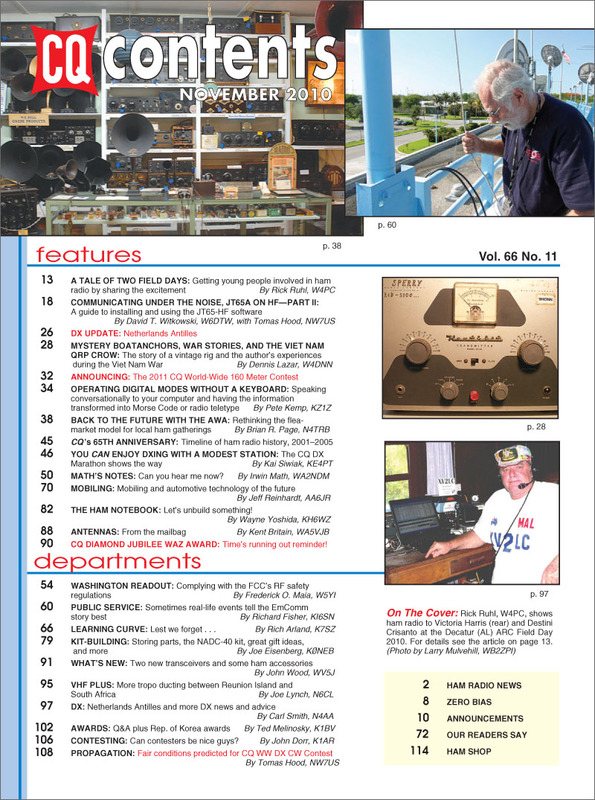 "Ham Notebook" editor Wayne Yoshida, KH6WZ, puts kit-building in reverse with his column, titled "Let's Unbuild Something," and Antennas Editor Kent Britain, WA5VJB, answers letters from the mailbag. In this month's "What's New" column, editor John Wood, WV5J, checks out two new ham transceivers and some cool station accessories; "VHF-Plus" editor Joe Lynch, N6CL, reports on more 2-meter and 70-centimeter tropo-ducting contacts between South Africa and Reunion Island, some 3000 kilometers (1800+ miles) away in the Indian Ocean. DX Editor Carl Smith, N4AA, has additional information on the Netherlands Antilles breakup as well as other DX news; Awards Editor Ted Melinosky, K1BV, answers questions about the USA-CA Award and introduces a series of awards offered by the Korean Amateur Radio League; Contesting Editor John Dorr, K1AR, asks, "Can Contesters Be Nice Guys?" and Propagation Editor Tomas Hood, NW7US, predicts fair-to-good conditions for both the SSB weekend (Oct. 30-31) and the CW weekend (Nov. 27-28) of the 2010 CQ World Wide DX Contest. See Tomas's last-minute forecasts on his website at <http://prop.hfradio.org>. That's a brief look at what's coming up in the November issue of CQ magazine, which should be on newsstands and in subscribers' mailboxes by late October. For information on becoming a CQ subscriber, click the "Click Here to Subscribe" button at the top of this page. Now available: 2011-2012 CQ Calendars! Order online from our webstore! Zero Bias - "The Importance of the 'Unimportant' "
CQ Diamond Jubilee WAZ Award - Time's running out!